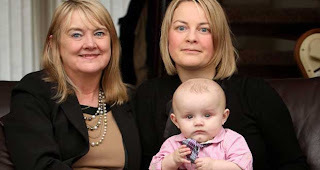 Feb. 26, 2011 - A 57-year-old woman has become Britain's oldest surrogate mother, having given birth to her grandson through in-vitro fertilization, officials said. Pamela Butler gave birth to Josef, her 5-pound 4-ounce grandson following four IVF attempts, the Daily Telegraph reported. Doctors impregnated eggs taken from Nichola Pagett, Butler's daughter, with sperm taken from Nichola's husband Mathew, and implanted them into Butler's womb. Baby Josef was born in August.